First of all, Acer Predator Helios 300 comes outfitted with a remarkable set of premium-quality features, and they’re “responsible” for its excellent performance. Among the most notable features, we can include the Intel Core i7-7700HQ, NVIDIA GeForce GTX 1060 graphics card, 16GB/32GB DDR4 RAM, and a Full-HD widescreen 15.6” display. Acer’s Predator Helios 300 is supplied with one of the best processors you can get for the money – the Intel i7-7700HQ is a must have for every desktop PC gamer, and it’s quite a rarity to see it outfitted on a gaming laptop. Essentially, it boasts a remarkable level of performance, excelling in numerous fields of performance, so let’s see what you can expect. Simply put, Intel Core i7-7700HQ is one of the latest letters in gaming tech industry. This marvelous processor is extremely powerful, but it certainly isn’t cheap. It features four cores and eight threads, and its base frequency estimates 2.80GHz while the maximum turbo frequency is estimated at 3.80GHz. What’s more, the CPU cache features 6MB of fast memory, allowing for an increased core performance. You’ll get the privilege to exploit up to 65 gigabytes of maximum memory size, as Acer’s Predator’s specs are fully compatible with this kind of a processor. Last, but not least, the i7-7700HQ brings a handful of Intel™ technologies aboard, including the Speed-shift, Turbo-boost 2.0, Hyper-threading, Virtualization VT-X, Virtualization I/O VT-D, VT-X EPT, and Intel 64. However, some of the top-shelf software modules were excluded, such as the vPro™, and TSX-NI. Overall, it’s quite safe to conclude that every gamer will be more than satisfied with this amazing processor. Gamers yearn for good graphics, and most desktop PC gamers (especially those who’re into competitive gaming) rely heavily on a good picture. The situation is drastically different when it comes to gaming laptops, as what players wanted to be “good” now has to be “nearly-perfect” or better. The reason for this is quite simple – “desktop” gamers usually maintain a healthy distance between themselves and their monitors, while “laptop” gamers tend to be a bit closer, leading us to the conclusion that smaller details could be spotted more easily this way. That’s just one of the reasons why Acer went with the GeForce GTX 1060 – it’s simply a bit better than similar models within the same price range. 6 gigabytes of GDDR5 frame buffer memory. the relative clock spanning to 1.4 times more. Overall, we’d describe this graphics card as remarkably good, especially on Acer Pro Helios 300 – it works like a charm, providing nothing short of perfectly rendered, lightning-fast frames and imaging, allowing for a complete gaming experience to take place. Built for comfort and efficiency, the DDR4 RAM is somewhat plain when compared to other features, but don’t let that dissuade you – you don’t need extra power in this sphere. Some hard-core gamers might not be satisfied with this feature, but you always have the option of upgrading your actual RAM, but be mindful of the fact that this CPU setting can support up to the maximum of 2400 MHz, which means that everything beyond will be automatically clocked to that digit. Again, we’re looking at a plain, yet exceptionally handy feature – the backlit keyboard. The standard “W-A-S-D” keys glow brightly red, greatly helping true gamers who are prone to spending nights conquering dungeons and shooting bad guys. The overall layout of Acer Predator Helios 300 keyboard is every bit as plain as your average keyboard, but with the exception of conveniently mid-sized keys that allow smaller hands to reach certain buttons with greater ease. 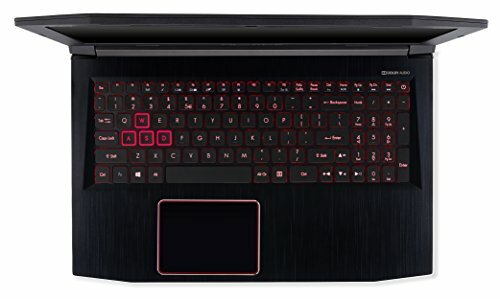 As you’ve probably figured, most laptop gamers use their engine in a similar way to the actual method of operation of a standard desktop PC – on a desk, plugged inside a power source, lest the battery fail. 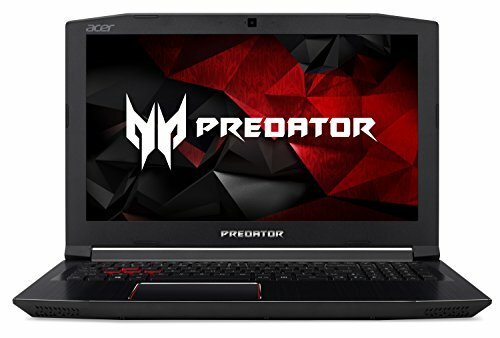 Acer Predator Helios 300 provides means to avoid uncomfortable leg or back crunching, as the battery may last up to seven straight hours once fully charged. Acer Predator Helios 300 features a Full HD IPS 15.6” display, which is pretty large by laptop standards. Needless to say, you can kick back and enjoy your games in a comfortable fashion without having to fret that you’ll miss a spot or a detail. 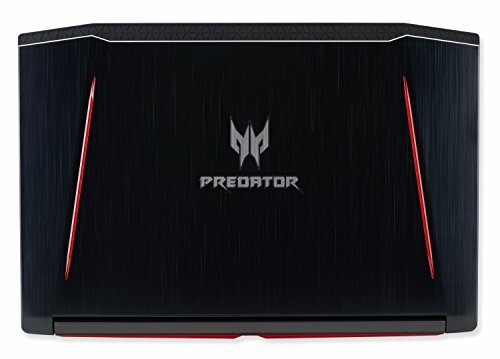 Nowadays, laptops are made in such a way so that they can go toe to toe with their desktop counterparts, and Acer Predator Helios 300 is not an exception. This model is a powerhouse that can easily match the performance of a high-end PC, all things considered. First of all, the features it comes supplied with are handpicked from premium brands, providing the much-needed combo of speed and power. Furthermore, the ultra-high resolution provides a comfortable experience, the one which won’t strain your eyes unnecessarily. Last, but not least, there are a lot of package options at your disposal, allowing for supreme versatility – just a couple of bucks extra will grant you the benefits of the “game drive bundle” and “Mixed reality headset”. 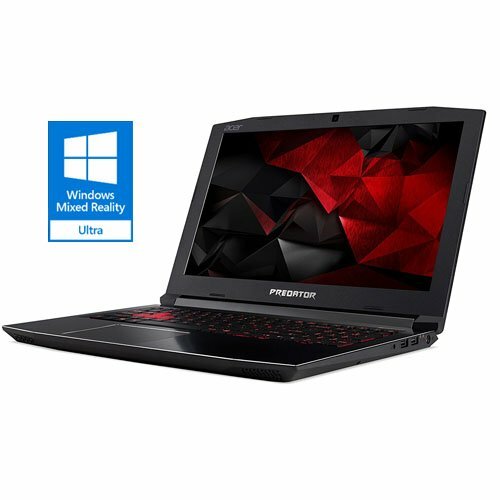 First of all, the Acer Predator Helios 300 is a “high-end” gaming laptop – it doesn’t come cheap. Nevertheless, it’s worth every single cent, as the potential benefits it offers heavily outweigh the minor flaws that come along the way. In fact, the only “bad” thing is that you’ll have to cash out a large sum of money, but, rest assured, your gaming needs and demands will be met in a glance. The standard “solo-laptop” isn’t a package, and it can be purchased for approximately a grand, but the extra packages cost little in comparison. The graphics come with a bit outdated drivers, and the process is sketchy, to say the least. Finding a good laptop is extremely hard these days, given that the market is extremely huge (and that’s an understatement) and most high-end models come with a relatively similar configuration. On top of that, certain brands offer “premium” packages and discounts to compensate for clearly invisible drawbacks, and we can safely assume that no laptop is “perfect”. However, upon close study of Acer Predator Helios 300, we’ve discovered that it might just be an exception from the aforementioned “rule”. This laptop excels in numerous fields of performance, ranging from plain durability, over supreme versatility, to the exceptional feature outfit. Firstly, its off-the-charts performance is something to marvel at, and secondly, the minor drawbacks concerning the firmware are easily compensated for by the heavily accentuated benefits it offers. We hope that you’ve found this review as helpful, and we wish you all the luck with your Acer Predator Helios 300! Overall, it’s pretty good for the buck, even though it doesn’t come cheap, per se. It does belong to the “expensive” price range, but we dub it as highly valuable for the cash for two reasons, amongst other things.